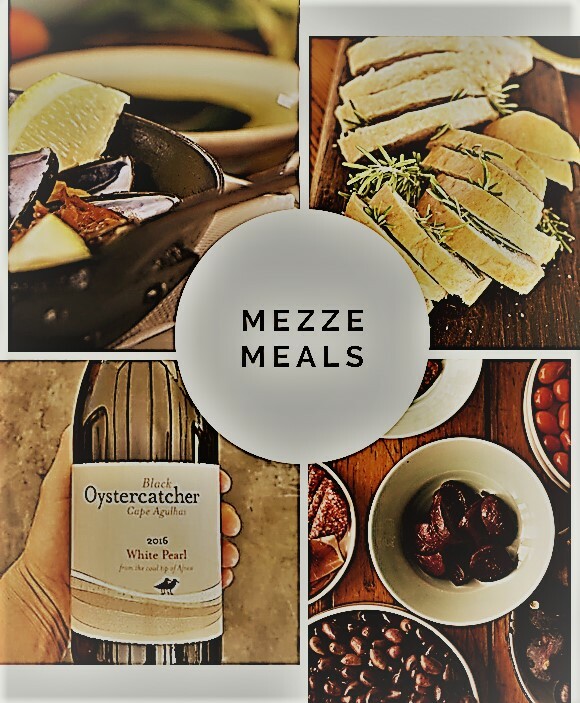 Mezze dining usually refers to small plates, with a variety of breads, dips, salads and other tasty pairings … and wine, of course! There’s something so cheerful and festive about mezze-style spreads. You share, dish and chat intimately around small plates … and glasses of wine! And small plates don’t mean less food. Rather, they mean more variety, more taste and flavours, lighter selections, and more fun ways to pair dishes. Bread is at the HEART of your mezze experience. Pair dips like hummus with oven-fresh bread like pita or lavash bread (even gluten-free bread works well). Aubergines make for great small-plate options. Like aubergine chips, or smoked or grilled aubergine (try it with feta, garlic and parsley), or even a smoky aubergine dip. It’s all about FRESH produce: Fresh tomatoes, cucumber and basil provide that wholesome mezze experience. When it comes to cheese, feta is your cheese of choice. It works well on its own, or roasted, or as a marinated herb feta. As for the meat portion, lamb kofta (lamb mince) pairs perfectly with pita bread. Or chicken breasts (tossed in lemon juice and olive oil) work well with aubergine dip or whipped feta. Or try a small plate of seafood: Mussels in a home-made tomato sauce are a lovely addition. And don’t forget that all important bottle/s of wine.